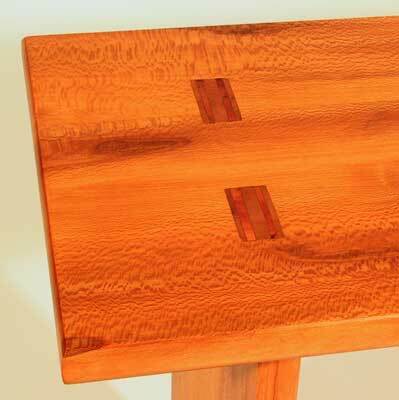 This small bench in wormy sycamore is about as simple as it gets. Essentially four pieces of wood held together by six wedged through mortise-and-tenon joints. It came about as I tried to move the remainder of my wormy sycamore out of the garage and into the shop. Scattered among the normal 4/4 lumber was a bit of thicker stock that was in horrendous shape -- cupped and split. I finally determined that this was the stock that the sawyer had left over when the regular boards were cut from the log. Whatever was left in the middle and containing the pith was left as it was and because it did contain the pith it distorted terribly upon drying. I decided that I could trim enough usable stock from these few boards to piece together a bit of finished wood in full 1-inch thickness. Now that I had an idea about the wood I had to come up with a project and this stout bench was the result. 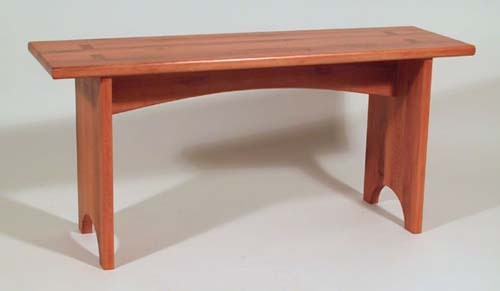 The overall lines of the bench are passably Shaker-like in their simplicity and aside from my choice of wood (they never seemed to have used sycamore, at least not in any pieces that have been published) they probably would not have found it offensive. The joinery is by six through wedged mortise-and-tenon joints. Unlike those in my recent bookshelf these have no shoulders, there being no reason to pretty up the parts of joints that can only be seen from underneath. The wedges in this piece are from English yew, that being the first piece of scrap that came to hand that was wide enough for the task. Finish is in my typical boiled linseed oil and padded-on garnet shellac. Overall size in inches: 39 X 12 X 18.